Because police get away with murder they do it again setting examples for other police to do the same. Prosecutors and lawyers who help killer cops go free must be held liable as accessories to MURDER. Stop rewarding lawyers with big money for doing the wrong thing and then claiming it’s legal and ethical because done in a court room. Judges, lawyers and prosecutors who side with killers because they work with them and befriend them. Stop in-house investigations by friends and co-workers who are not objective when their own commit crimes. Please watch this documentary which exposes how killer cops get away with lying, claiming they feared for their lives yet murder innocent people. Tax payer’s families are destroyed and then tax payers are forced to pay the bill. Hold those who commit these crimes personally liable and accountable. Demand harsh, long prison terms for killer cops and those who protect and help them escape justice. No more passing the buck to the “victim” and tax payer. 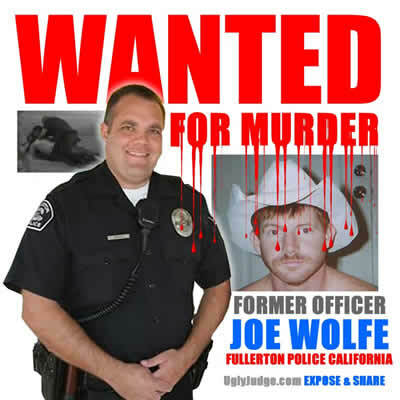 Bakersfield California Police where 9 officer murder a 33 year old man and destroyed video evidence.